It’s called Sargassum, brown algae (seaweed), a term coined by Portuguese sailors—which has even been attributed to Christopher Columbus (1492 expedition: first time someone reported crossing the Sargasso Sea). Today, many, many, species of Sargassum have been identified; however, Sargassum natans and Sargassum fluitans are the most relevant to us. Small gas-filled spheres resembling berries, which keep the seaweed afloat, evoked memories of a type of grape known as salgazo (later sargaço). At first glance, beach-lovers might view it as nothing more than a foul-smelling annoyance (and sure, you may want to keep your distance once it starts to decompose); however, do remember that the once floating mats were home to (and source of food for) a huge variety of sea life. In fact, several creatures, like the Sargassum fish (a type of frogfish), are born, reproduce, and die solely within this environment! Sargassum is a prime nursery habitat for a diversity of large fish, such as mahi mahi (a.k.a. dorado, dolphin), sailfish, jacks, amberjacks, etc. 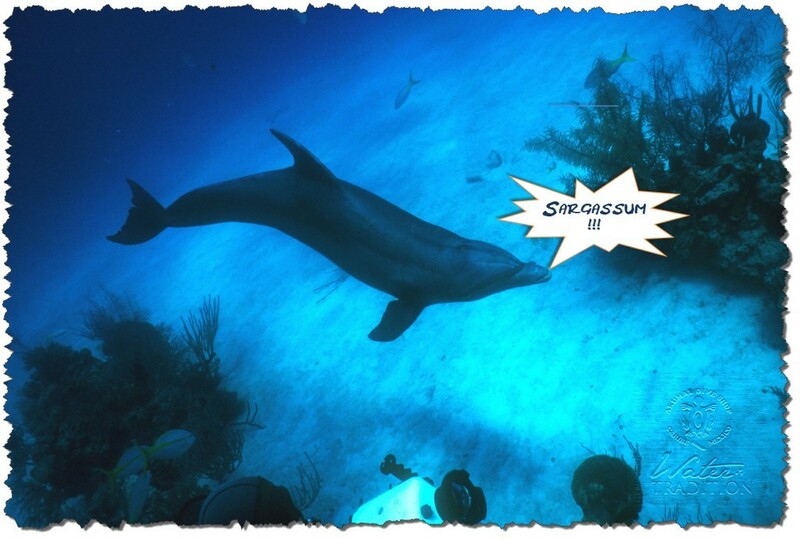 Reportedly, a dolphin whistle was translated for the first time by advanced pattern-recognition software – and it said, “Sargassum”. 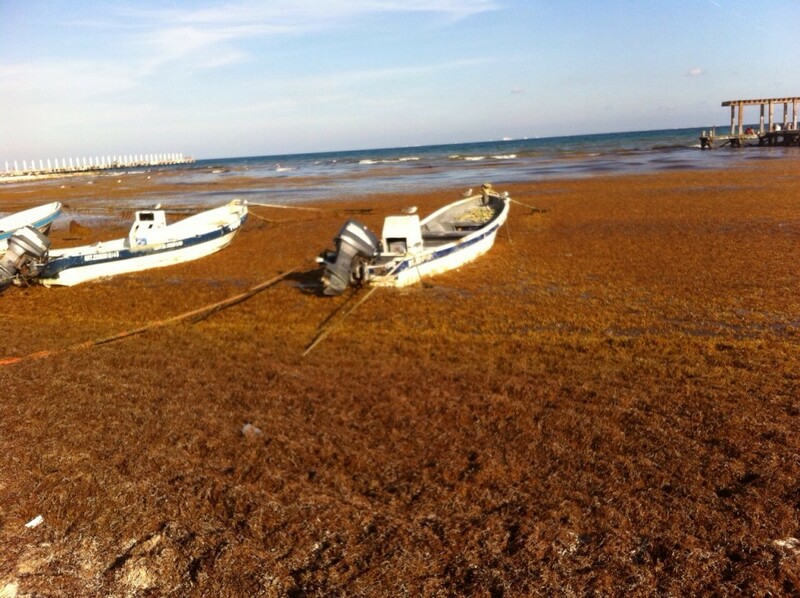 Local experts think this particular bout of Sargassum originated off the coast of South America. When ocean conditions are ripe, pelagic (i.e., living in the open ocean) sargassum can form “islands” a few acres across (3-5 ft. deep). Sargassum can survive a wide range of temperature and salinity; therefore, you’ll find it floating in every ocean except the Antarctic… and (pardon a pun) currently on our shores, plenty of it! On the other hand, within the Sargasso Sea (a sea full of sargassum, as the name suggests, about 10 million tons of it!) – a vast region in the Atlantic that almost rivals Australia in size – a few scientists have actually been reporting less of it. Did you know? Sargassum is edible, it’s harvested to feed livestock too, and you can fry, boil, steam or dry it. It’s played a part in Chinese medicine as far back as the 8th century, treating goiters (high iodine content) — and made into tea to control phlegm. No clear answer! Sargassum reproduction is asexual, which means that every bit of the same species could probably be traced back to its original ancestor; therefore, some consider it the largest organism in the world! Due to totipotency (a cell’s ability to give rise to unlike cells and develop a new organism), when a part breaks away, it’s not the end of it; the fragment drifts and could seemingly reproduce forever. 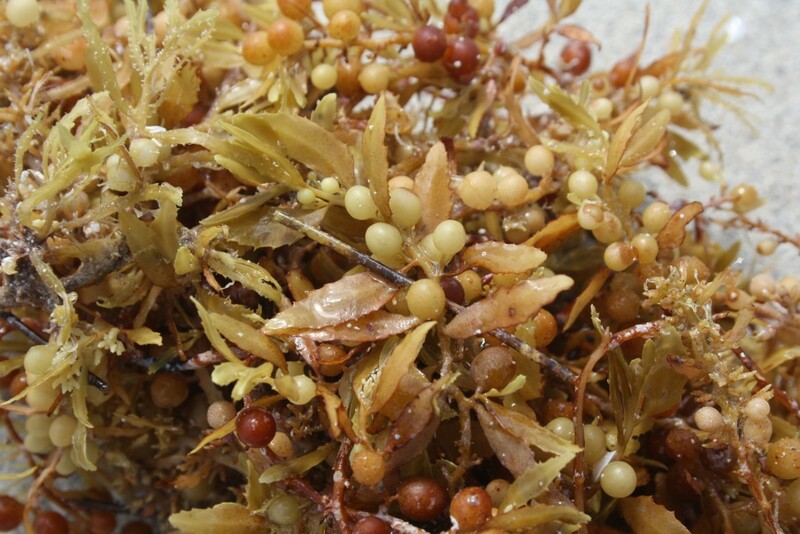 Nonetheless, Sargassum eventually becomes too heavy, less buoyant, and sinks into the deep sea… or goes coastal! • Global warming: it’s a tropical plant; therefore, warmer oceans = more ocean to “bloom”. Nonetheless, temperature alone is not enough to make it thrive. • Pollution: nutrient-rich waters act as fertilizer for the seaweed (it was thought that they were reproducing locally as a result of more nutrients). • Disturbance in liquid boundaries: winds, storms, and spiraling currents help disperse Sargassum throughout the world’s oceans. The Sargasso Sea, which exists exclusively in the Atlantic Ocean (specifically, in the North Atlantic Gyre), spreads 1,107 km wide and 3,200 km long – approx. 2 million square miles (Mexico is merely 761,610 sq mi). The only sea without fixed land boundaries, its limits are formed by dynamic ocean currents. Several kinds of algae float across oceans worldwide; however, the species of sargassum found here are ‘holopelagi‘ – meaning they float and reproduce at high seas (not on the ocean floor). One distinguishing feature of the Sargasso Sea, apart from ‘The golden floating rainforest’ appearance, is its remarkably clear blue water – divers would be greeted by 200 ft. (61 m) visibility! Do ‘ocean’ and ‘sea’ mean the same thing? A sea belongs to the ocean; seas are normally found where land and ocean meet. 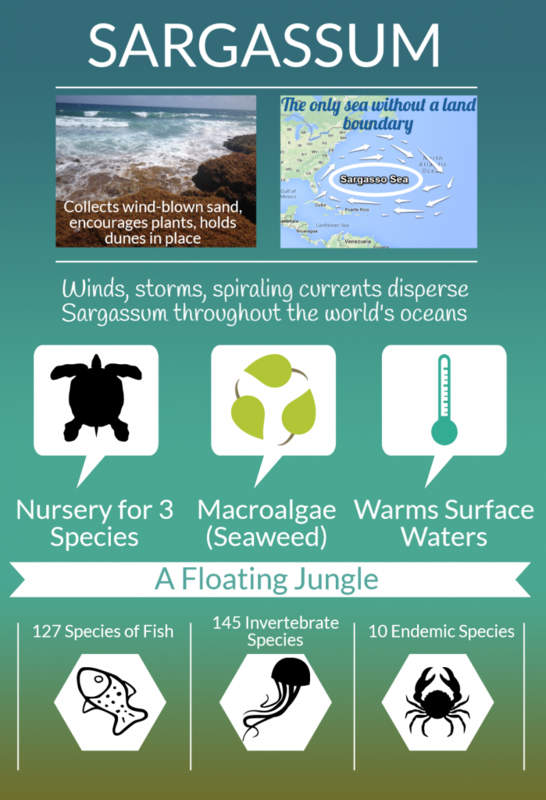 Sargassum provides a food source, home, and shelter to an amazing variety of marine species (plant, shrimp, crab, bird, fish, turtle and whale). Turtles use sargassum mats as nurseries. Five species of sea turtles that pass through the Atlantic have been recorded there, and for at least three of these species, the loggerhead (Caretta caretta), green turtle (Chelonia mydas), and hawksbill (Eretmochelys imbricata), the Sargasso Sea is vitally important. Invites pretty much every species of big-game fish that fishermen dream about catching. On shore, it’s a source of food for crabs, insects, and a myriad of tiny creatures, which in turn feed shorebirds and other coastal animals. Important for collecting wind-blown sand (anchoring it to create dunes) and encouraging plant growth (due to the nutrients it contributes); long-term, restoring eroded beaches and, short-term, helping reduce wave and wind erosion on the beach! Potential in the medical and pharmaceutical fields. Serves as biofuel and land fill. At times, unsightly (especially when accompanied by man-made marine debris). Unpleasant smell, once it begins to decay. Collects floating garbage that may pose a health or environmental risk. Too much Sargassum can make it complicated for nesting sea turtles to arrive at shore; and for hatchlings to reach the ocean. Also, it’s more difficult to monitor turtle tracks. It can adversely affect tourism. Invasive species (e.g., Lionfish) can hitch a ride. Decomposing in water, it can promote blooms of harmful bacteria / microbes; resulting in serious skin irritation. When removed from the beach, heavy machinery tends to compact the sand (this can affect turtles nesting, e.g.) and remove both sand and nutrients from the shore, which can lead to beach erosion. Hoteliers and local authorities have been coordinating to remove sargassum from our beaches, either manually, in wheelbarrows, or using different types of heavy machinery. Removing it remains necessary; nonetheless, as this cannot be done without unintended consequences that lead to beach erosion (e.g., removing sargassum removes sand, heavy machinery compacts sand, etc. ), making informed decisions about how to manage excess sargassum is equally important – particularly because there is so much we have yet to understand. Tentacle Tuesday: seafaring octopuses and the men they have shamelessly devoured – Who's Out There? 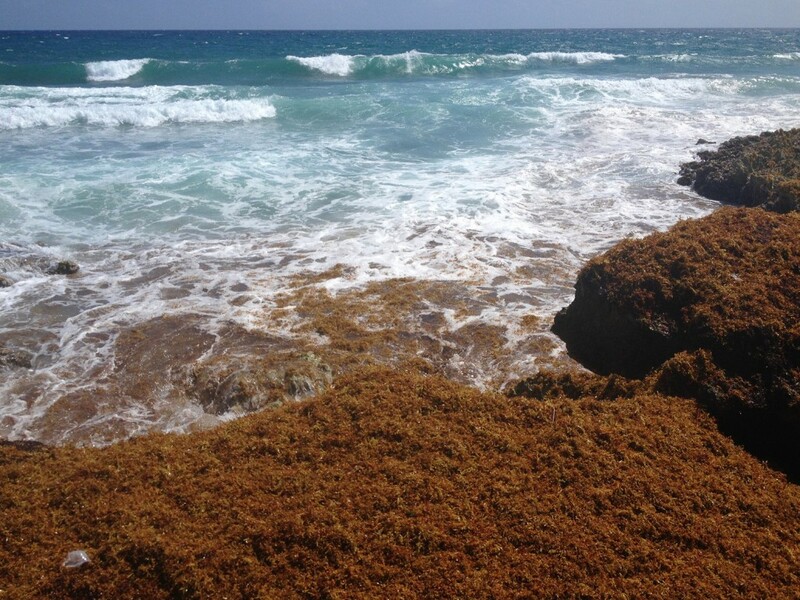 A sargassum situation – Where in the World!? If this gift was harvested before hitting the shore – transformed into natural fertilizer…. It is a powerful nutrient and the field to many medicinal discoveries. According to recent research – an extract from this seaweed can balance the sugar in the blood – goodbye diabetes.